It is authentic and it can be found reproduced in Arkham House’s Selected Letters series of books. Technically it is a drawing of the Cthulhu IDOL, not of Cthulhu himself. A small difference, but given Cthulhu’s plasticity of shape, possibly a critical one. Yep, that’s HPL’s work. He doodled a bit, and, on top of those two Cthulhus, I have two instances of Pickman’s model, among other stuff. Oh yes, there were two floating around online for quite some time! 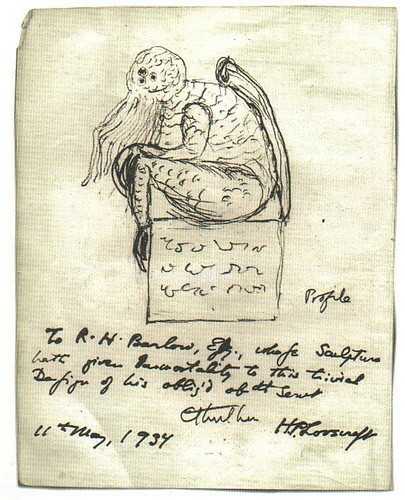 I’m not sure where I first saw Lovecraft’s sketches… probably the aforementioned Selected Letters books or perhaps in a chapbook on Barlow. I don’t rememeber whether Joshi and Schultz’s “O Fortunate Floridian” reproduce the drawings(?). Btw Zombiequadrille, those sculptures are amazing. Fascinating! Straight from the Master, himself. Thanks for sharing this wonderful image. Just posted the link — and a reminder about Lovecraft eZine — to my LJ, Yaddith Times. Thanks!